By the time you read this post, I will be away camping on beautiful Cortes Island with my children and their cousins. 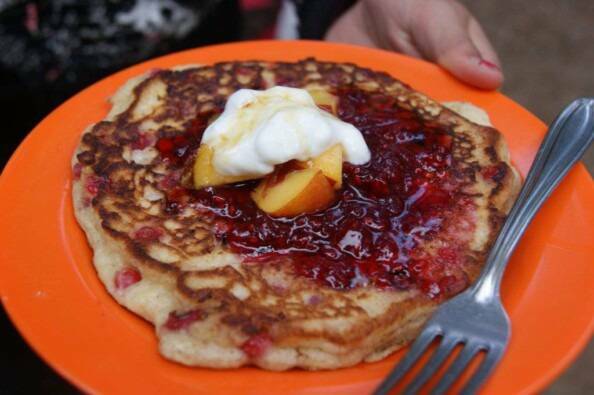 I will, without a doubt, be making a giant batch of these pancakes on the trip, possibly on this very day. 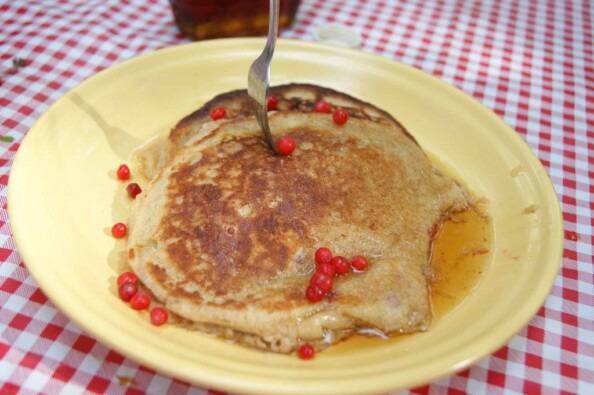 Apparently, a camping trip without Auntie Heidi’s huckleberry pancakes is unthinkable. What I have noticed about Huckleberry Pancakes is that they are memory-making. For the many children in my life, this is not about liking the taste of the pancakes, it’s about the whole experience – from being sent (unsupervised!) into the bush to pick berries, to eating the giant pancakes around the fire or out on the beach. Whether or not the children enjoyed picking the berries or eating the pancakes, they always, always talk about the experience with great enthusiasm. 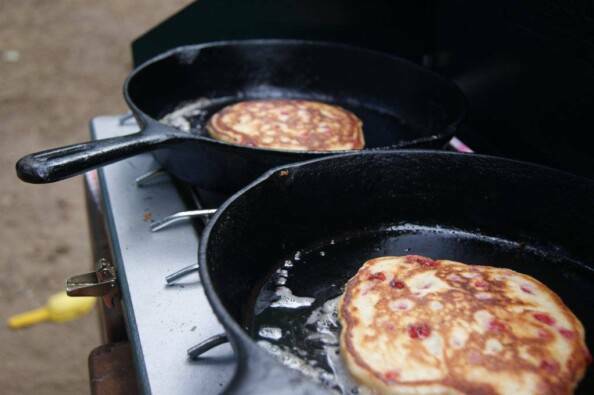 That this easiest of camping recipes is also the most memorable has me thinking that I should start serving pancakes for dinner, too, and forget all about the Bison Burgers and Tandoori Chicken. Hahaha…ahahahaa….ha…. So, let’s talk about huckleberries. I continue to be amazed, actually completely shocked, at how few people know that these berries are edible. I notice that huckleberry bushes are still loaded even in the busiest campgrounds, even after the best picking weeks are over. I have had well-meaning adults come over to my site to warn me that my kids are eating wild berries. I know, shocker! This is in stark contrast to the camping of my childhood when, as I remember it, we had to seek out the un-picked huckleberry bushes in areas distant from the campground. 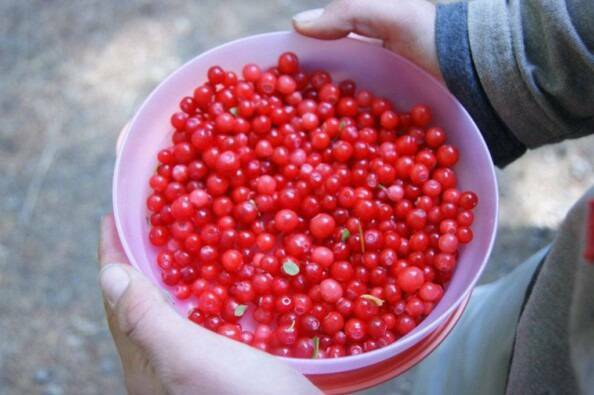 As second-generation Islanders, all local edible berries from blackberry to salal were familiar to me and my sisters, as well as to most of the other children camping nearby. What has changed? More families moving to the West Coast from distant parts? Increased fear about allowing children to harvest food from the wild unsupervised? I just don’t know. 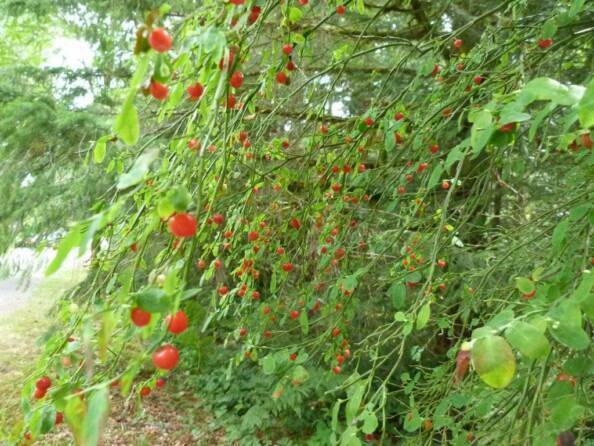 I do know that once any person over the age of, say, three, has been shown what a huckleberry bush looks like and has been allowed to pick and eat from it, they will never make a mistake about it again. Off you go, young ones, and pick us some huckleberries! The huckleberries around here are more formally known as the Western Red Huckleberry, to distinguish them from the more widespread and familiar blue huckleberry. Both red and blue huckleberries are in the same plant family as blueberries. Red huckleberries grow all over Vancouver Island, the Gulf Islands and the mainland; for many years, that was the only kind of huckleberry I knew of. But I have since picked blue huckleberries in Strathcona Park and at higher elevations in places around the coast. Since there is at least one other red huckleberry look-alike (small-leaved bush with round red berries) to confuse the issue, here is a foolproof tip to help identify a huckleberry from an impostor. Look for the “navel” on the blossom end of each berry. Navel = always a huckleberry! 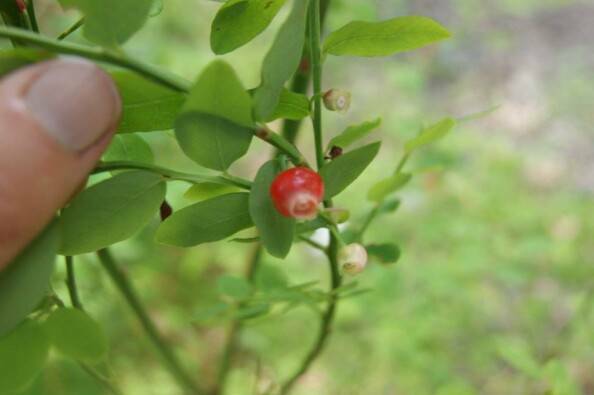 The “navel” of a huckleberry. Can be big or small. Now, on to turning your kids’ wild berry labour into pancakes: I mix up all the dry ingredients a day or so before we leave and put it in a ziplock bag, making sure to write on the label how big of a batch it is so I know how many eggs to add and how much buttermilk to bring. Next, make sure you pack the appropriate wet ingredients (eggs, buttermilk, butter) and toppings (syrup, jam, yogurt, extra fruit) and definitely make sure to pack at least two frying pans and a bowl big enough to mix the whole batch of batter. Not much else to it, other than making sure to cook one large pancake at a time in the center of each frying pan. Please. Otherwise they will be burned on one half and raw on the other. Those campstoves concentrate their heat in a 4-inch circle in the middle of the pan. I make the pancakes big enough that most people are full after one. Makes 6 to 8 large pancakes. 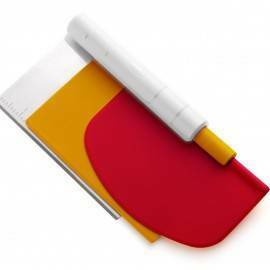 Recipe is easily doubled or cut in half. Don’t forget your cast iron pans, flipper, and a bowl big enough to mix the batter in! 1. Whisk together the dry ingredients in a bowl until evenly blended. 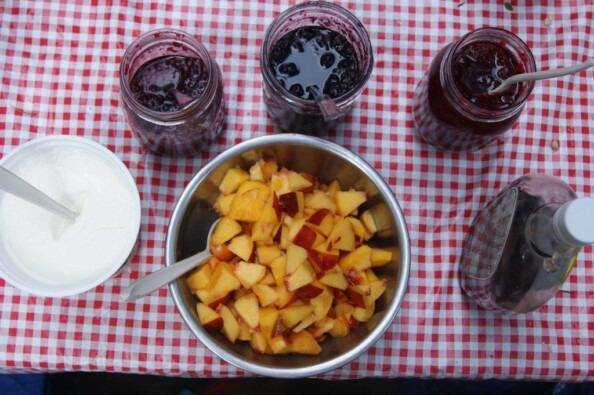 Pour into a ziplock bag, seal, and put with your camping dry food. 2. On pancake day, send children into the bush to pick huckleberries. While they are gone, melt butter and set aside to cool. Crack eggs into the big bowl you brought, mix with a fork (or a whisk, if you had enough room for one), then add the buttermilk and the butter. Mix again. Add the dry mix and stir until a smooth batter forms (the whole wheat flour will prevent the pancakes from getting doughy). Let rest at least 20 minutes. 3. While you are still waiting for the kids to return, get out any of the toppings you brought and make sure there are enough clean plates available. Set up the pans on the stove(s) – the more stoves and pans you have here, the faster this will go. 4. 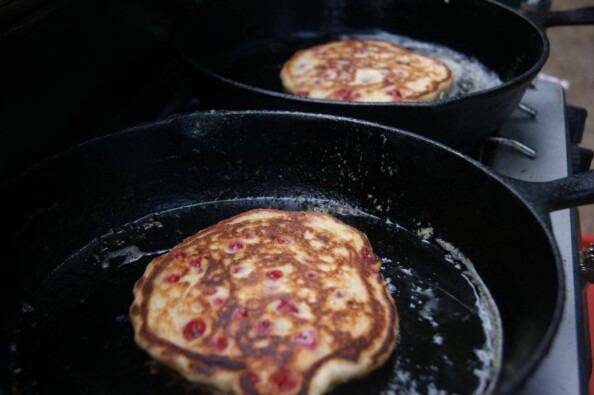 When the kids return, you can mix the berries directly into the batter, or wait to dole out on individual pancakes. 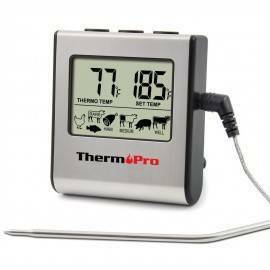 Heat your pans over the lowest heat possible (campstoves are notoriously too hot). Put a bit of butter in each pan and wait until the butter is melted, even sizzling. Spoon batter into the middles of the pans, one large pancake per pan. This is very important. Campstoves, in addition to being to hot, also tend to concentrate their heat in a 4-inch center circle. If you try to cook three or four small pancakes in your 10-inch pan (totally possible at home), you will have pancakes that are raw and drippy on one half, and burned on the other. One big pancake in the center of each pan! Feel free to remove the pan from the heat or to turn off the heat from time to time to allow the pan to cool down. A bit of a hassle, but definitely worth it if you want to have properly cooked pancakes. 5. 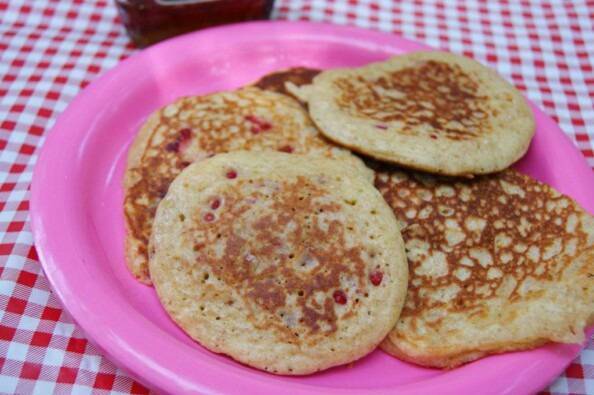 If you are individually doling out the berries, sprinkle a handful on the top of each pancake before you flip it over and press the berries gently into the top (still raw) batter with your flipper. Flip the pancakes when they are bubbly on the top. Cook for several minutes on the second side. Serve immediately. Continue with the rest of the batter. 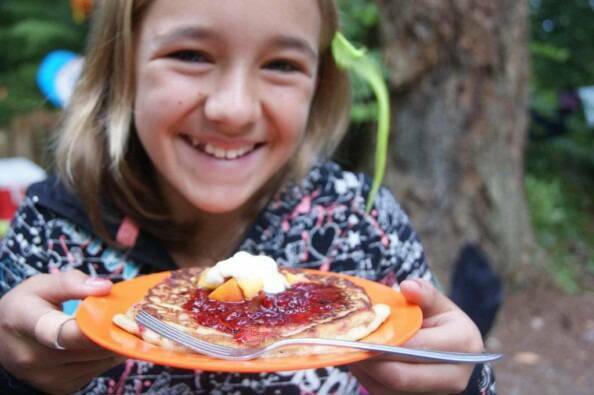 I remember the smell of those wonderful pancakes wafting over to my campsite the morning we had to leave…mmmmmmmm….and thank your niece so much for me for the education in huckleberry picking. I gorged myself thoroughly all down the coastline back to Nanaimo. Sadly, I haven’t seen them here in Alberta, but a local green thumb tells me they will grow in my backyard. Seriously considering a few plants. Those pancakes look absolutely delicious! I really need to get a proper camping stove, and leave my lightweight one for backpacking. I can’t wait to try them:) Thanks for the post. 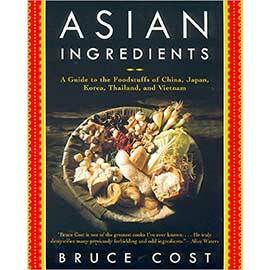 Have you given any thought to offering recipes that are gluten free? I am now on a gf restricted diet which means most of the yummy things you make using wheat flour I can no longer eat. Thank goodness for all the Indian dishes you prepare. I’m told it’s the best type of meal plan for gf foods.